From a feng shui perspective, healthy plants energise a room, prevent chi from stagnating and attract positive energy and emotions. 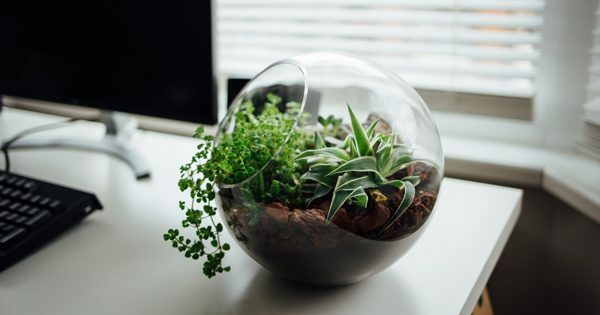 But did you know, research has proven plants are not only emotionally uplifting, they can also absorb harmful chemicals and improve indoor air quality in your home or business? The most common harmful airborne chemicals found in the average home or office are formaldeyde, benzene, trichloroethylene, and carbon monoxide. Even in low concentrations, these chemicals can cause a variety of health problems. According to former NASA research scientist Dr. Wolverton, several varieties of houseplants excel in removing these chemical pollutants from the air (How to Grow Fresh Air, 1996). The most effective in removing formaldehyde were Philodendron, Spider Plant and Golden Pathos. Two common flowering varieties were the most efficient at removing benezene; these were Gerbera Daisy and Chrysanthemum. 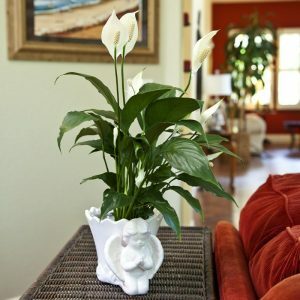 The Peace Lily (see photo below) and the Chrysanthemum removed the highest percentage of trichoroethylene. Since all plants utilize carbon in the process of producing new growth, all these varieties are effective in removing low levels of carbon monoxide. Other varieties found to be especially effective in cleaning the air were; English Ivy, Chinese Evergreen, Bamboo Palm, Snake plant (mother-in-law’s tongue), several types of Dracaena, including Marginata, Corn Plant, and Janet Craig. Where do all those harmful chemicals come from? Formaldehyde is used in particle board or pressed wood products to make office or household furniture, in carpets, permanent pressed clothes, water repellants & fire retardants. Other sources include natural gas, kerosene, and cigarette smoke. Formaldehyde irritates the membranes of the eyes, nose, and throat and can cause headaches. Benzene is present in inks, oils, paints, and plastics. In addition to irritation of the eyes and skin, chronic exposure to low levels of benzene causes headaches, loss of appetite, and drowsiness. Trichloroethylene is used by dry cleaners and in printing inks, paints, varnishes and adhesives. This chemical is considered to be a potent liver carcinogen. All plants produce oxygen through the process of photosynthesis. Thus any plants you choose, in addition to the varieties named here, will increase the concentration of oxygen in their immediate surroundings. Remember: Choose only the round leafed options from the chemical vacuum cleaners listed above. Pointy or sharp edged plants are considered bad feng shui to have inside your home as they cut the chi and air creating energetic daggers. Hi Giselle, thank you for your kind words about my article. Happy planting, Carol.